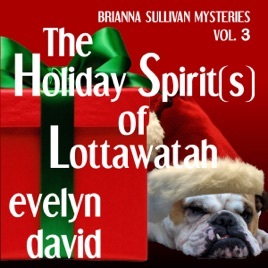 The third volume of the Brianna Sullivan Mysteries finds psychic Brianna still in over her head in Lottawatah, Oklahoma and maybe head over heels with the town's deputy. This book contains two stories. 'Tis the season to be jolly and the ghosts of Lottawatah are determined to horn in on the holiday revelry. In Giving Thanks in Lottawatah, Brianna Sullivan must find an engagement ring that has been missing for 35 years, deal with the mother of her boyfriend who is holding a grudge because Brianna almost killed her with crab dip, and wrangle family ghosts to give up old secrets and enjoy the holiday. There won't be much to celebrate at Christmas for 14-year-old Tim Cramer unless Brianna can find the killer who framed his father for murder. Her best witness? The dead man himself. But getting a ghost to spit out the information she needs is never easy. Instead, Brianna must use old-fashioned detective skills to find the real killer and bring holiday joy to Tim and his family.